The sensitivity of a laboratory test shows how often the test is positive in patients who suffer from a particular disease (disease positivity). It shows the chance that the test will correctly identify a person who actually has the disease. When a sick person is being tested the results of the test can be positive or negative. The positive result is true positive (TP), and the negative result is a false negative (FN). This negative result determines mistakenly a sick person as healthy one. When a healthy person is being tested the results of the test can also be positive or negative. In this case, the negative result is true negative (TN), and the positive result is a false positive (FP). This positive result determines mistakenly a healthy person as a sick one. The sensitivity of a test is calculated based on research of patients with 100% proven disease, so the false positive results are not included in the calculation. Test with 100% sensitivity does not show false negative results. This means that the test will show positive results to each patient with the disease. All the negative results in a test with 100% sensitivity will be true negative results. Such test is ideal for a screening test because the negative results exclude illness. However, the positive results may include true positive and false positive ones. The specificity of a laboratory test shows how often the test is negative in patients who do not suffer from the disease for which the test was created (negativity in the absence of a disease). It shows the chance that the test will correctly identify a person who actually does not have the disease. 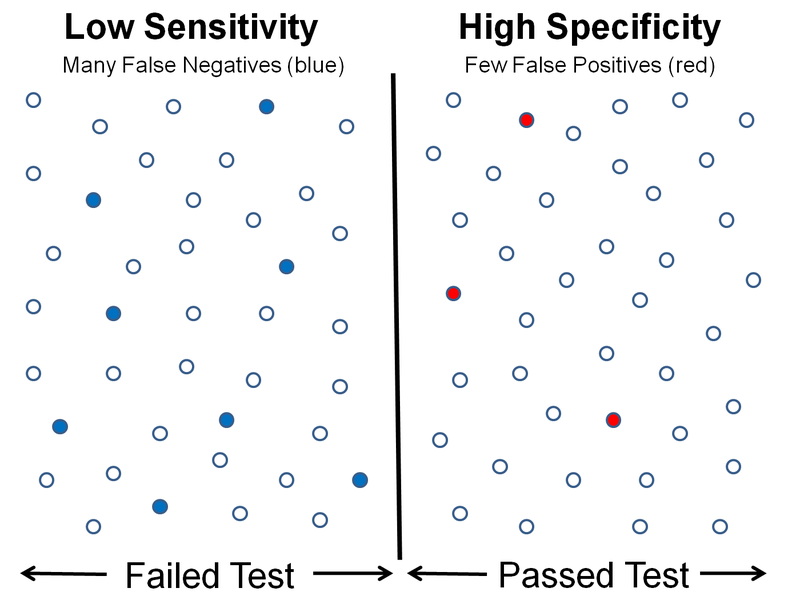 A test with 100% specificity does not have false positive results. This means that the test is always negative in healthy people. The positive results are always true positive. The results, however, can include also false negative ones, which are not included in the calculation. 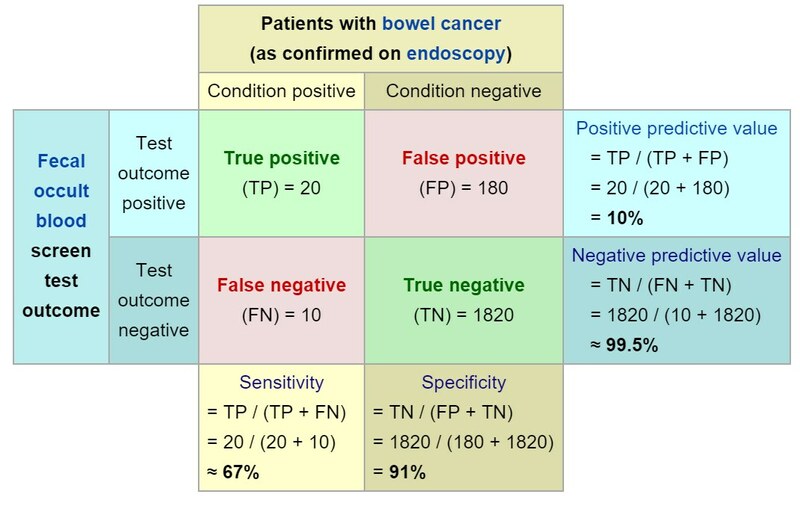 A test with 100% specificity is used for confirmation of the disease because the positive results are always true. Ideally when there is suspicion for a certain disease a test with 100% sensitivity has to be used. If the result is negative the patient does not suffer from the disease. If the result is positive another test has to be used – with 100% specificity. If the result is negative, the result of the previous test is a false positive. But if the result is positive the patient suffers from the disease. For example, if there is a suspicion of AIDS it is appropriate to do ELISA test, which is with high sensitivity. If the result is negative the patient does not have AIDS. But if the result is positive, Western blot test (which is with high specificity) has to be done. If the second test shows positive result – the result from ELISA has been truly positive. If the result from the second test in negative – the ELISA result has been false positive and the patient does not have AIDS. Sensitivity: The sensitivity of a laboratory test shows how often the test is positive in patients who suffer from a particular disease. Specificity: The specificity of a laboratory test shows how often the test is negative in patients who do not suffer from the particular disease. Sensitivity: Test with 100% sensitivity correctly identifies every person who has the disease. 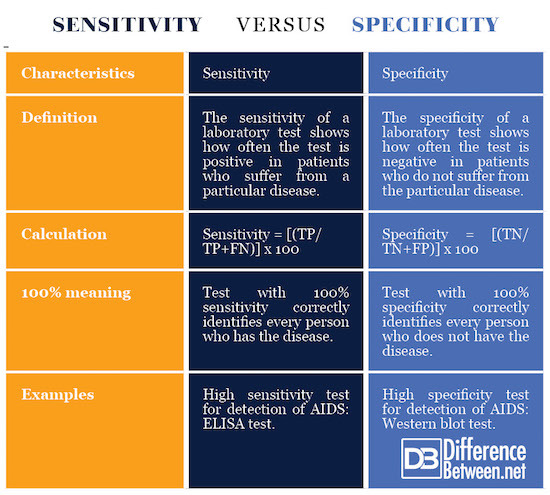 Specificity: Test with 100% specificity correctly identifies every person who does not have the disease. Sensitivity: ELISA test is a high sensitivity test for detection of AIDS. Specificity: Western blot test is a high specificity test for detection of AIDS. The sensitivity of a laboratory test shows how often the test is positive in patients who suffer from a particular disease. The specificity of a laboratory test shows how often the test is negative in patients who do not suffer from the particular disease. Specificity = [(TN/TN+FP)] x 100. A test with 100% sensitivity correctly identifies every person who has the disease, while a test with 100% specificity correctly identifies every person who does not have the disease. Ideally when there is suspicion for a certain disease a combination of a test with 100% sensitivity and a test with 100% specificity has to be applied. ELISA test is a high sensitivity test for detection of AIDS. Western blot test is a high specificity test for detection of AIDS. Dr. Mariam Bozhilova Forest Research Institute, BAS. "Difference Between Sensitivity and Specificity." DifferenceBetween.net. July 23, 2018 < http://www.differencebetween.net/science/health/difference-between-sensitivity-and-specificity/ >. Dutton, M. Orthopaedic Examination, Evaluation, and Intervention. New York: McGraw-Hill. 2004. Print. Indrayan, A. Medical Biostatistics, Fourth Edition. Boca Raton: CRC Press. 2017. Print. Ivanov, I. Internal diseases. Sofia: Pensoft. 2003. Print.